One hundred Northwest Missouri State University students representing the academic areas of natural sciences, social sciences, health sciences, fine and performing arts, education, business and computer science presented their work April 5 as the Society of President’s Scholars sponsored its annual Celebration of Quality. A panel of judges awarded a total of $500 to presenters based the quality of their work, their ability to explain the project and its value to people within and outside the field of study. Among the winners in the category for posters and displays were Kristen Edmisten, Mariah Gann, Kennedy King and Sophia Palmerin for their research project, titled “Books Before Birth: Case Study of an Expectant Mother Reading to her Baby in Utero,” sponsored by behavioral sciences faculty Dr. Keely Cline and Elizabeth Dimmitt. Their poster provided highlights of their ongoing research of the impacts expectant mothers observe when reading books aimed at their developing babies, including Barbara Park’s popular book, “Ma! There’s Nothing to Do Here!” The students were inspired to conduct the research after learning about a reading program in Colorado that involved expectant mothers reading to their babies in utero during doctor’s office visits. “Our objective was to see how families who were expecting babies will perceive the books that are specifically targeted toward reading to babies in utero,” Gann, a junior biomedical sciences major from Callao, Missouri, said, noting their interviews with expectant mothers revealed the reading helped them develop stronger bonds with babies in utero as well as other children in the family. “We worked all year on this and being able to tell people about it and have them know about it is nice because we worked really hard on it,” Edmisten, a senior psychology major from Kansas City, Missouri, said of the opportunity to present their research at the Celebration of Quality. Chance Casey, a senior studio art major from Kansas City, Missouri, participated in the symposium by presenting his series of ink and water color illustrations of Haute couture fashion. Casey’s work focused on the concept of anxiety blankets, which are designed as oversized, wearable blankets made to help the wearer feel comfortable. Sponsored jointly by the Society of President’s Scholars and the Office of the Provost, the Celebration of Quality annually invites students to submit their best work completed throughout the previous year. 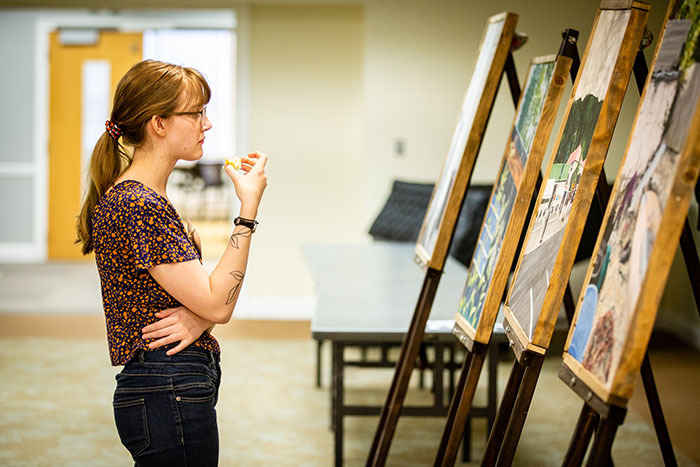 The interdisciplinary symposium gives the Northwest community a chance to view student work and places it in front of an audience beyond the classroom. Submissions are accepted from all students at the University. This year’s event culminated with an evening banquet for participating students where Northwest Professor of Theatre Dr. Theo Ross delivered a keynote address. The 2019 Celebration of Quality award winners are listed below.